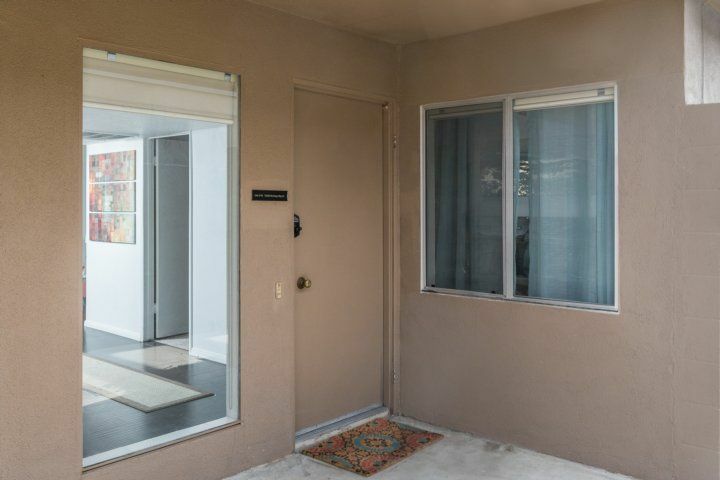 This completely renovated 1BR condo is situated inside the gates of the private Bermuda Dunes Country Club. 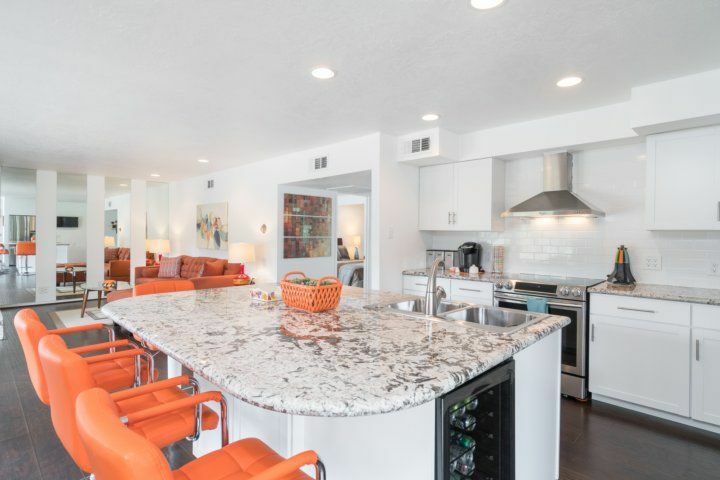 The beautifully redesigned space features a hip minimalistic design with chic interiors that pop with color. 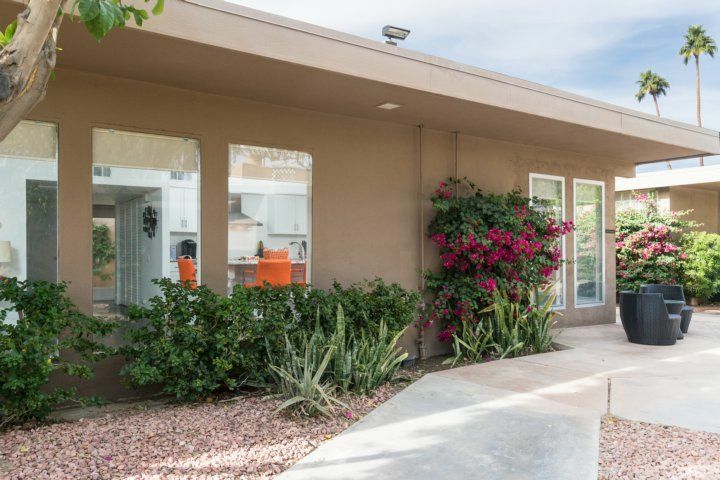 Nestled in a small enclave of Mid-Century modern condos, this property sits on the edge of the golf course with access to a heated pool. 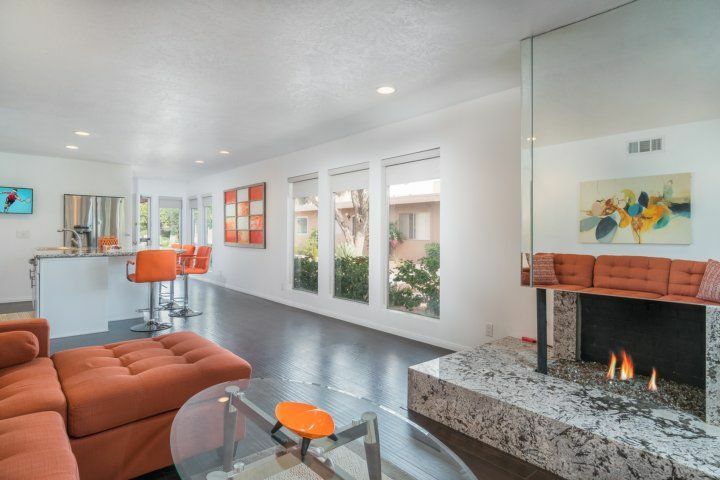 A bright white interior bursts with colorful orange accents in the living room. Relax on the modern sectional sofa after a fun-filled day in the desert sun. 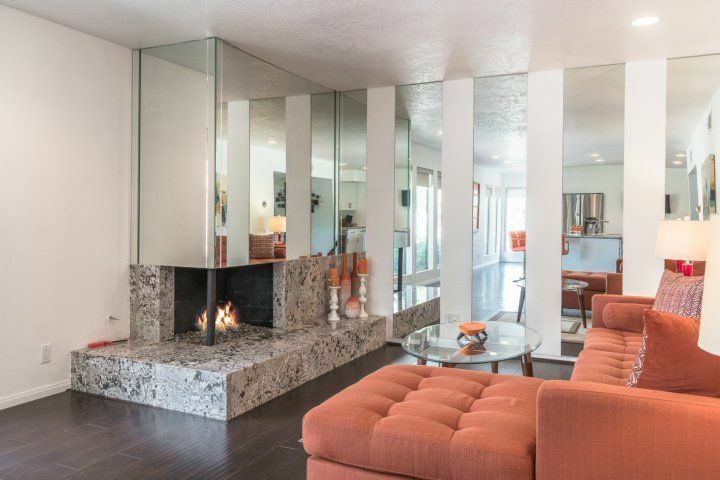 A gorgeous granite fireplace adds warm ambiance on cool evenings. 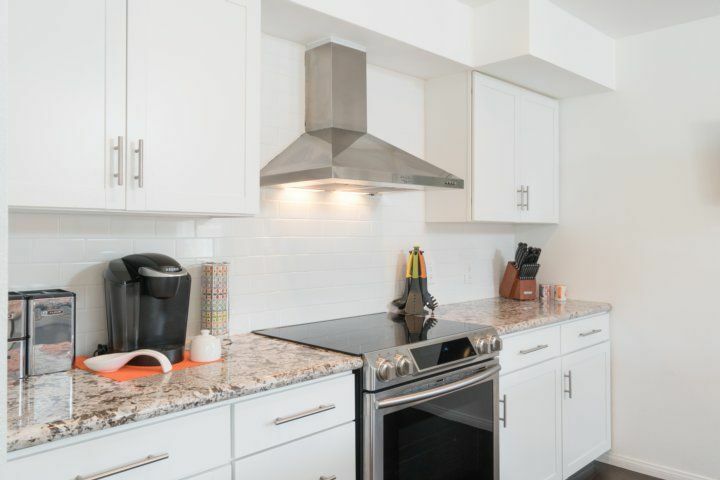 Granite countertops and stainless-steel appliances shine in the posh kitchen. 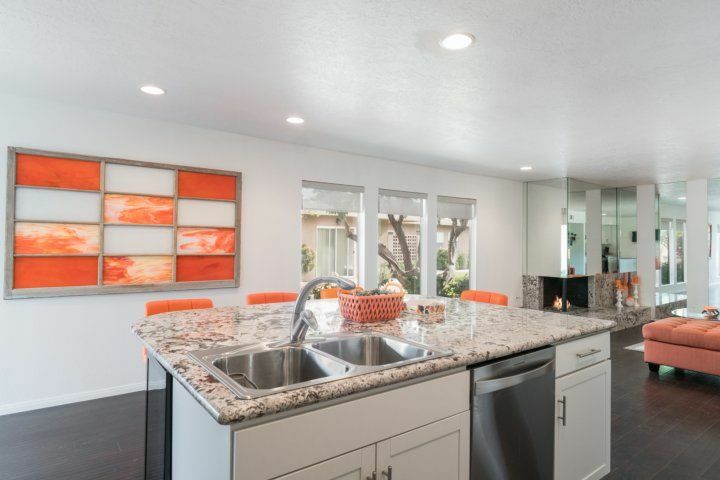 A large island offers plenty of prep space for home-cooked meals as well as seating for four. 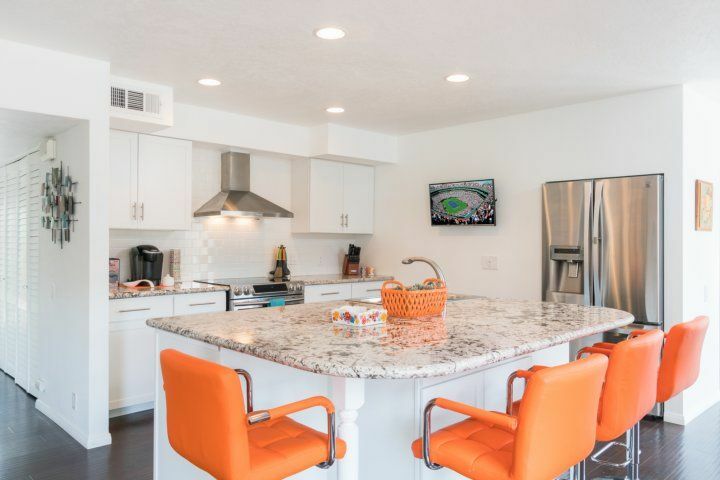 The completely renovated kitchen is complete with a separate beverage cooler and 32? flat screen TV. 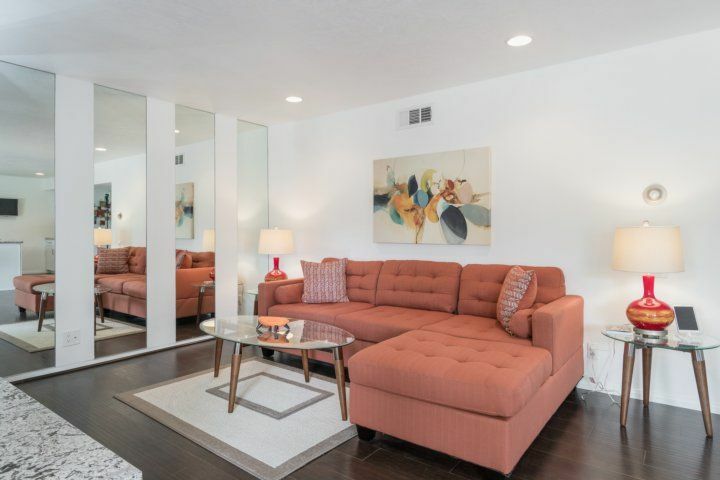 This condo includes one bedroom and a den space that sleeps four total. 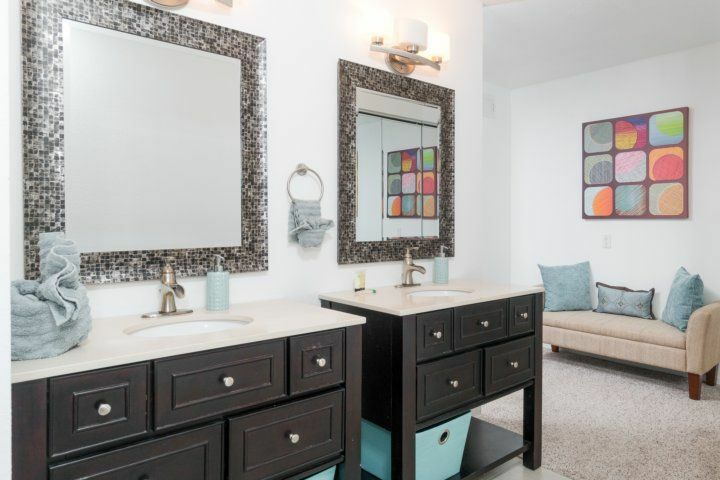 Two full bathrooms are each stocked with a complimentary starter supply of toiletries. 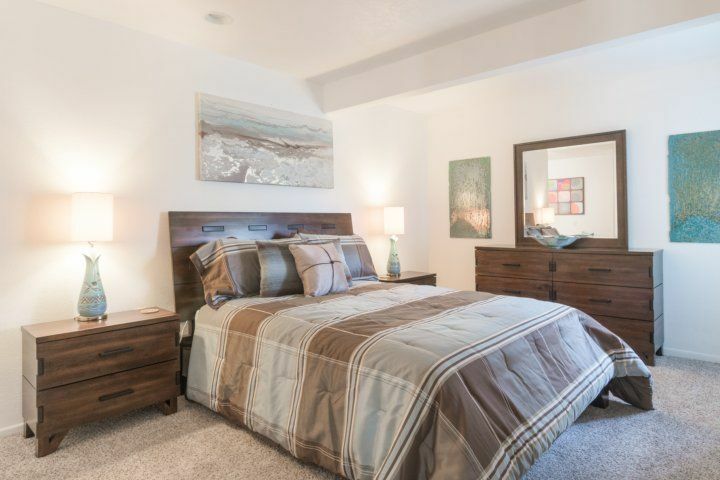 Retreat to the master bedroom outfitted with a queen-size bed, a 55? 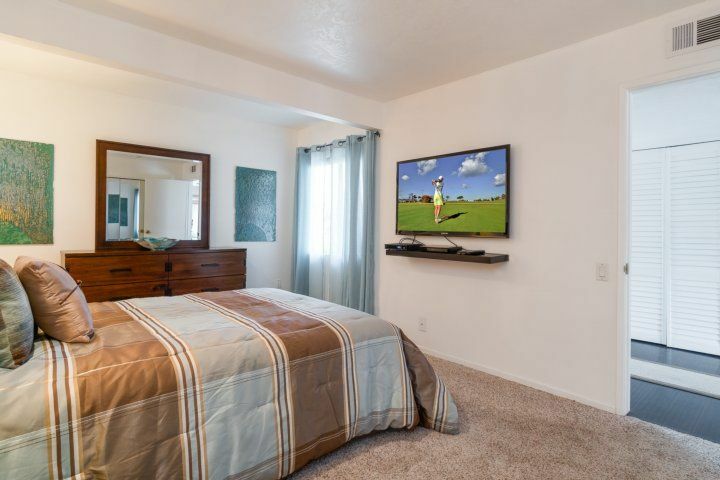 flat screen TV, and two sets of mirror closets. 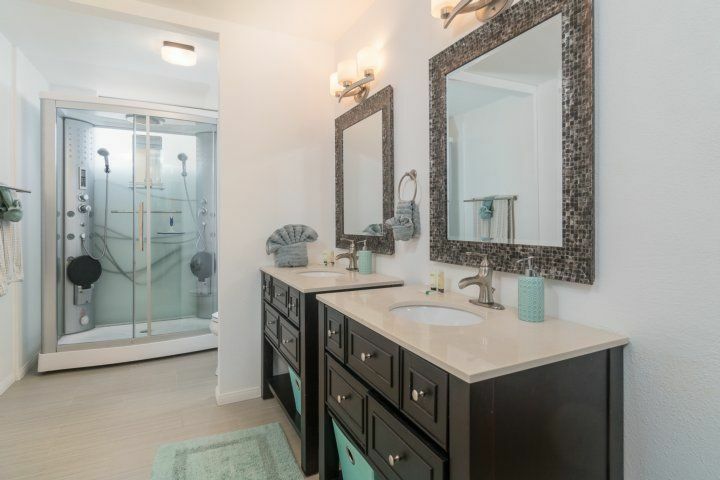 The en-suite bath features a double vanity, and a walk-in steam shower with dual shower heads, multiple jets, and temperature controls. 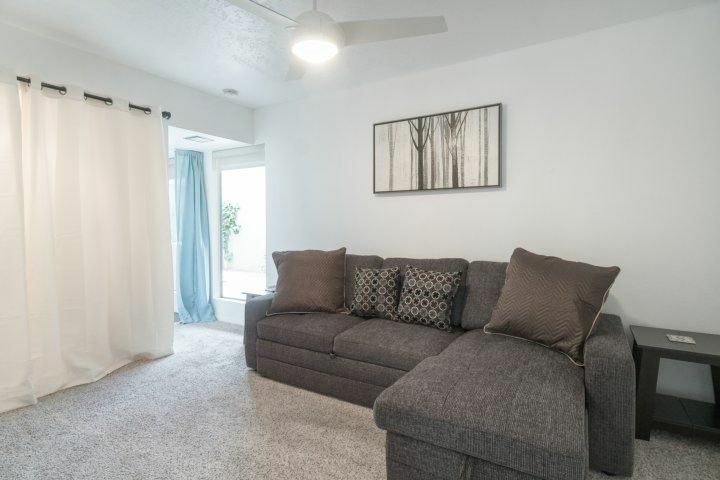 A separate den space doubles as guest quarters with a pull-out sectional sofa, 42? 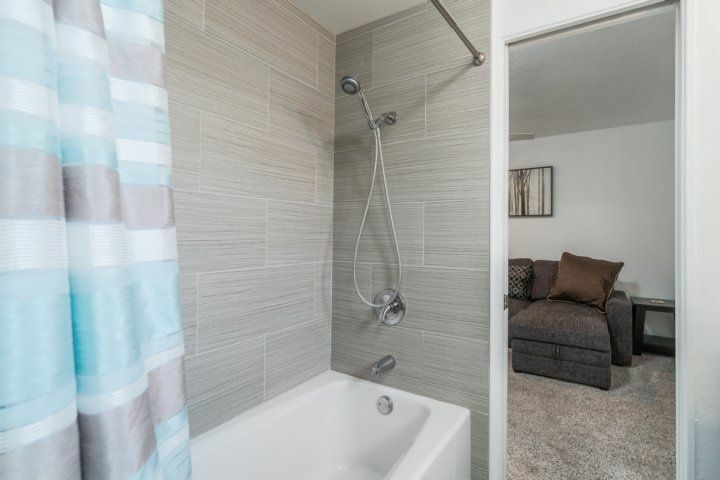 TV, closet, and access to the bathroom with a tub/shower combination. Enjoy a cold beverage and unwind on the comfortable furniture by the back patio. A shared heated pool allow for an evening dip under the desert moonlight. A private patio area is perfect for dining al fresco. Parking is available for one vehicle in the garage and one additional space in the driveway. A washer/dryer and complimentary Wi-Fi are provided. Take a day trip to nearby Joshua Tree National Park -- just a 35-minute drive from home. Outdoor enthusiasts can explore hiking and walking trails, mountain biking paths, and an abundance of climbing routes filled with freestanding granite boulders. Premier luxury shopping and dining awaits at the beautiful tree-lined El Paseo shopping district -- a dynamic collection of world-renown designer boutiques and inviting restaurants. Upon arrival, easily access your home with a keyless secure door code; no need for an in-person key exchange. Your rental will be professionally cleaned and ready for you to enjoy. You can expect all the comforts of a fine hotel, including shampoo, soaps, paper products, towels, and linens. 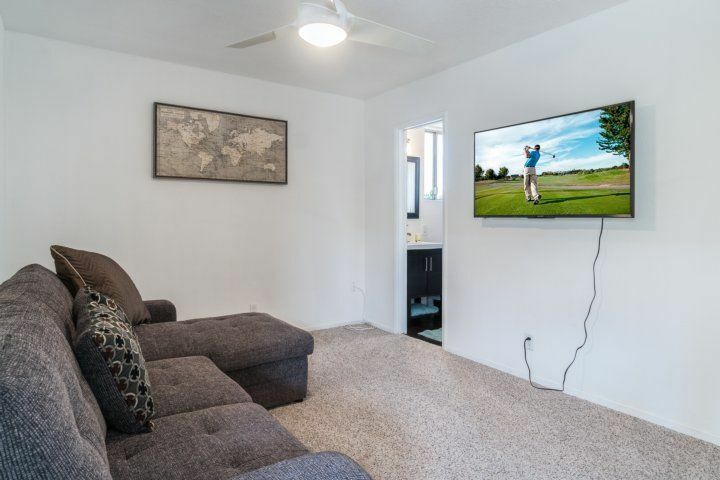 Your home will include a HomeDroid tablet (electronic guest directory) providing specific home details, local suggestions, Wi-Fi access, TV instructions, and more. Stayed for 8 days in March, 2018 The villa itself is lovely and spacious. 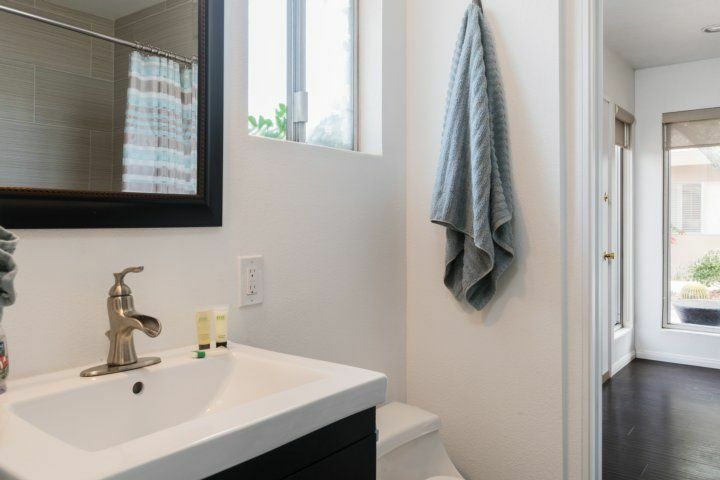 It has all the amenities and more that you would want. Lovely but complicated shower, the bed is luxurious. Unfortunately, the patio is not as shown,it is in a walk way and there is no BBQ other than a community one which would entail passing rude and unfriendly neighbours.